Vancouver, the self-styled “world’s greenest city” has built Canada’s largest passive house. It’s all part of an effort to combat a severe and pioneer a new pathway to zero emission buildings. That’s great because buildings account for 25 per cent of all carbon emissions worldwide. Vancouver even has a Greenest City Action Plan and is working on a Zero Emissions Housing Plan. Vancouver is a coastal city and Sean Pander, Vancouver’s green buildings manager acknowledges this reality. And this is where Scott Kennedy of Cornerstone Architecture comes in. 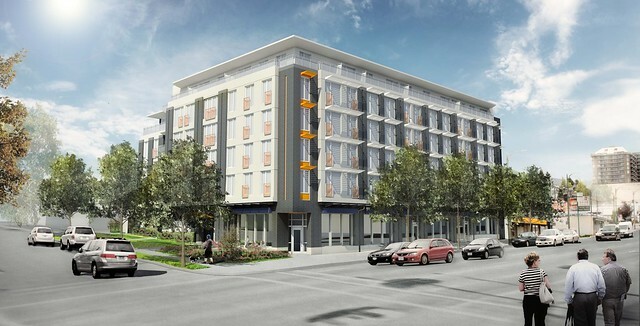 He was designing a new 85-unit building for 8th Avenue Development Group and he proposed to the developer they could save $450,000 on mechanical systems and another $150,000 on natural gas if they built to a passive house standard instead of LEED Gold. Kennedy instead proposed to spend the money on passive house certified materials such as windows and double R40 walls. They were pleasantly surprised the developer proposed the solution. and are working with them to understand the drivers. In fact the City is so enamoured with the passive house idea they are already writing it into policy as an option for builders. The passive house standard is relatively new to Canada. However, it’s very big in Europe. They have more than 60,000 passive standard buildings. The result is Canada’s largest passive house, an 85 unit building in Vancouver. The difference between LEED Gold and passive house standard is a singular focus on energy. The passive house standard is designed to be 90 per cent more energy efficient than a standard building. No furnace – each suite will require about 300 watts of heat which will be provided by small electric resistance heaters. For the record that’s about one third of the energy of a single hair dryer. The beauty of the Skeena passive house, properly known as “The Heights” is renters will live in one of the highest quality buildings in Vancouver. This is in stark contrast to the plague of leaky condos built in the building booms of yesterday. It’s Vancouver’s Rental 100 policy that trades favorable zoning and waives development levys if developers commit to retain 100 per cent of the suites as rentals for 60 years. So here we have a city with two big goals dovetailing at once. They want to radically transform the energy efficiency of their city to combat climate change while providing more affordable housing. The Skeena project is not even complete, but Kennedy says Cornerstone Architecture is already working on 16 more passive house projects. The passive house standard requires the use of certified windows with special insulated frames that cost three times as much. This has local window companies folks keeping a close watch. Anton Van Dyk of Centra Windows says North American triple glazed windows are great. However, they still don’t meet the passive house standard. Redesigning the frames would cost up to $300,000. This means window companies are watching closely to see if the market for passive homes takes off. Vancouver is able to set building standards thanks to a city charter, special powers granted to the city by the province. The cities of Edmonton and Calgary are currently negotiating city charters with the province of Alberta to get similar powers. Builders, developers, suppliers and three levels of government convened recently in Vancouver at the Pembina Institute’s Pathways to Net-Zero thought leader forum. Among attendees, there is an emerging consensus that new buildings can and should be net-zero standard. In Vancouver it appears that the passive house concept is ready to deliver energy efficiency, radical emissions reductions and an affordable path to the super energy efficient buildings of the future.